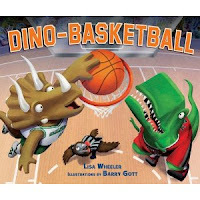 The team that brought us Dino-Baseball, -Soccer and -Hockey (2010, 2009, 2007) this time delivers nothing but net. . .This fourth book in the series will be adored by sports fans of all ages - especially for children who love sports & dinosaurs! The book is so much fun to read aloud since it is written in rhyming stanzas on each page. The illustrations are so much fun to look at - very colorful, bright, and exciting! The text is very fast paced, fun, and it really makes you feel like you are there in person watching the game! I cannot wait to read the next book about...football! I would recommend this book to boys or girls, basketball/sports lovers, and of course dinosaur lovers! This would be perfect for any family with little ones, and/or an elementary classroom. If you are interested in buying this book, click on the title (link) of the book above and buy it on Amazon! Thank You so much Net Galley and Carolrhoda Books (Lerner Publishing Group) for allowing me to read this book! I cannot wait to read more books from you in the future!